Now train travelers in India can book their train ticket using their Mobile Phones with GPRS facility simply by downloading an application and making payment using Debit or Credit Card. 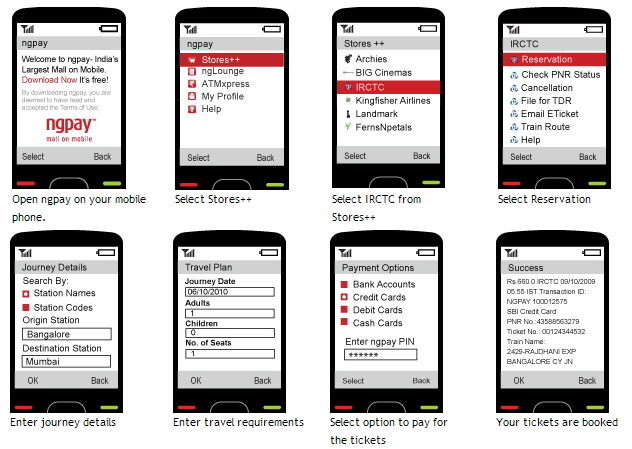 In order to book train ticket customer should have a Mobile Phone which is Java enabled and Internet Connection. Customer have to download atom or ngpay for booking their tickets. Payments can be made through Debit or Credit Card. Visit the website http://www.atomtech.in/download.aspx and Download the Atom Mobile Application to your Mobile Phone. 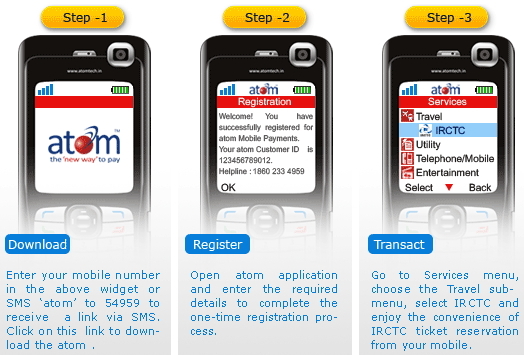 Or sms ATOM to 54959 to receive a link on your mobile phone for downloading Atom App or Download atom from Google Play. Open the application and Register by entering your details. Registration is a one time process. Once Registered customer can go to the Service Menu and choose Travel from the options available and select IRCTC from the lists. Enter the Travel Details and the Passenger details and book your ticket and make payment using Debit or Credit card. You will get the ticket in your Mobile Phone. Travel using that ticket with any Identity Proof. Visit the website http://www.ngpay.com and download ngpay into your Mobile Phone. ngpay is available in Apple Store, Google Play etc. or SMS ngpay to 56767 to get a link directly in your mobile phone for downloading ngpay. Once you download and Install ngpay on your Mobile Phone simply click and Open it. Click and Open Stores++ and click on IRCTC. Click on Reservation from a list of options available under IRCTC. Enter the Travel Details like From, To, Date, Time, Seats, Passenger Name etc. and select the payment option like Debit Card, Credit Card, Net Banking etc and enter the Payment details and your Ticket will be booked and your ticket will be mailed to your e-mail address and you can travel using the printout of the mail and a Identity Proof.